We all know that the female Betta does not give birth to live young. 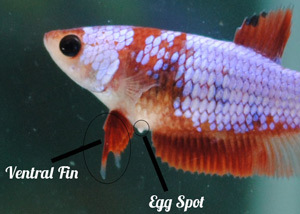 Like most aquatic species, her eggs are laid which are then immediately fertilized by the male Betta. 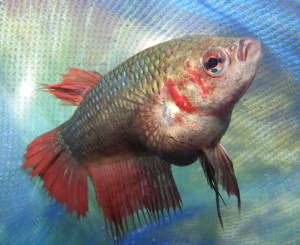 The female betta is far from a nurturing mother and the raring of her young is left entirely up to the male Betta fish. A female Betta fish is classed as a ‘spawning fish’ (her eggs are laid and then fertilized by the male) meaning she will never truly be pregnant. In saying this, a Betta fish does carry her eggs for a short period of time and appears bloated similar to other species that give birth to live babies. ‘Gravid’ is a common term given to a Betta fish that is currently carrying eggs. When a Betta fish is gravid, many people will refer to their fish as ‘being pregnant‘. 2 Is my Female Betta Fertile? 3 Was the Mating Process Successful? It is important to condition your Betta fish prior to attempting to repopulate. A healthy fish is more likely to produce eggs that have the chance of becoming fertilized. You should always be providing your Betta fish with a happy and healthy environment although if you intend on breeding your Bettas now is the time to provide them with extra tender love and care. To prepare you Bettas for the spawning process provide them with nutrient rich foods. This include live foods such as bloodworms, brine shrimp and earthworms. When introducing your female to your male Betta, it is a good idea to use a hurricane glass or a tank divider. This allows you to observe their reaction to each other and estimate how the mating process will go. Betta fish are unpredictable when it comes to the breeding process so it is necessary to take precautions when possible. You can find more information on conditioning your Betta fish here. Is my Female Betta Fertile? There are some subtle signs and symptoms that can signal to you that your Betta fish is ready to produce eggs. A fertile Betta fish that is producing eggs will have white vertical stripes on her, while a male who is ready to mate will make this apparent by creating bubble nests in his aquarium. If your male Betta has created a bubble nest this is an appropriate time to introduce the female into the aquarium. If the female Betta feels that the nest is right, she will allows the male to squeeze the eggs from her ovipositor. Alternatively, if the female Betta is not impressed by the male’s efforts she will show him by destroying the bubble nest. If your female Betta fish is already carrying her eggs you may notice a round white patch on her stomach. This patch is called an ovipositor which is an egg-laying organ situated between her ventral fins. The ovipositor is where she will shortly release her eggs from. The underside of a gravid Betta’s belly will appear full and bulging. It is important not to confuse a gravid Betta with a fish that is suffering from constipation. A female Betta fish that does not mate with a male Betta fish will expel any unused eggs in her aquarium. If this occurs you may notice your Betta fish looks less bloated. Unfertilized eggs will not hatch and will not become Betta fry. If your Betta fish appears bloated, has white stripes and a visible white dot (ovipositor) you can assume she is carrying eggs. It is important to remember that just because your female is carrying eggs it may not result in eventual fry. Both the male and female Betta must be ready and even if both of them are, often Bettas are choosy when it comes to who they mate with. Was the Mating Process Successful? If you have introduced the female into the male’s aquarium you may now be wondering how to tell if the mating process was a success? If the mating process was successful you may be able to see tiny flecks in the male’s bubble nest. If these flecks grow in size over time, there is a good chance you will be welcoming tiny fry into the aquarium before you know it. 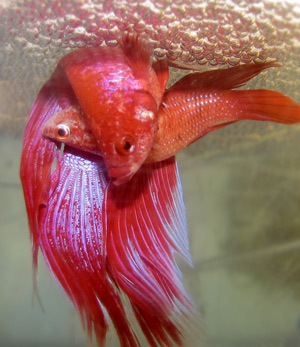 Ensure you remove the female Betta immediately after you feel the mating process has ended. The male becomes very protective of the bubble nest and will not hesitate to defend it of any intruders. My betta female in think dont like the male,b coz i put together but the male fight with her,im worry to my female betta almost want come out the egg,what need to do?